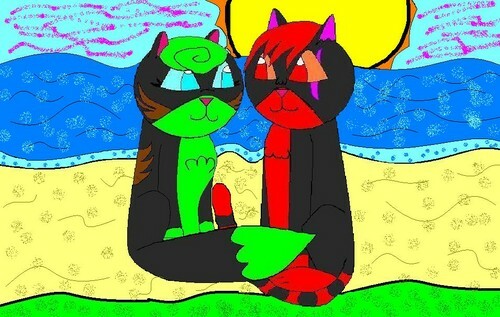 Hawkears(green) and her mate Scarpath(red). i went on the website, got my bf n my own warrior name and drew them together on a romantic beach(sundrown place).. HD Wallpaper and background images in the Make Your Own Warrior Cat! club tagged: warrior cats. Sorry i forgot to put this, obviously real cats dont have green and red-red fur. so if they were realistic drawings the green would be grey and the red-red would be a real redish fur color.